Pasta dishes are a favorite in our home (maybe that contributes a bit to my menopause middle, giggle). So I thought I would share some of my “perfect pasta” methods. YES-Use plenty of water, the ideal amount is 4 to 6 qt. per lb. of pasta. This allows the pasta enough room to cook without sticking together. NO- There is no need to add oil. If you have enough water, you won’t need to add oil to prevent sticking. YES – Add salt for flavor but not too much; remember that your sauce will also add flavor. YES- Stir pasta when you first add it to the water to prevent it from sticking together and to the bottom of the pot. NO-Don’t throw noodles against the wall to test for doneness (not even if you’re angry) remember you’ll just have to clean your wall later. Instead, use the cooking time on the package directions as a guide. Then try a piece to see if it’s the right texture. I like my pasta “al dente” (a little chewy), but you might like it softer. NO- Don’t rinse cooked pasta; you’ll rinse away the starch, which actually helps the sauce stick. Only rinse pasta if it will be used in a cold salad. Now that you’ve got perfect pasta down, try this recipe. Before You Start: Remove meat from lobster shells and cut into 1/2-inch pieces. Let’s make it! Heat 3 Tbsp oil in a Dutch oven, add 3 Tbsp garlic and sauté 2 minutes. Add lobster meat; sauté 5 minutes. Remove lobster and place in a bowl and cover. Add remaining oil, remaining garlic and onion to Dutch oven; sauté 10 minutes. Add tomatoes, oregano, salt, mace, pepper, bay leaf and tomato puree; cook over medium-low heat 15 minutes. Remove bay leaf and discard. Meanwhile, cook linguine in a large pot of lightly salted boiling water until al dente. Using a colander drain and place in large bowl Drain and keep warm. Remove 2 cups tomato mixture and place in food processor. Puree return pureed mixture to pot. Add lobster meat with any accumulated juices; cook 2 minutes or until lobster meat is cooked through. Remove from heat. Stir in cream. Pour sauce over the top of the linguini and top with parsley. Toss well to mix. Throwing pasta on the wall is a waste of perfectly good noodles! Looks oh so yummy, Katherine! This looks so yummy! Now I am hungry for pasta! I've started a new blog strictly for my fashion musings! Check it out and follow me there while I revamp my current blog!! Katherine, how did you know I love lobster? Yum! And with pasta? (I put extra pasta in baggies in the fridge to nibble on, even when I'm dieting, hmmm!) Thanks for stopping by my blog. You have a really lovely blog and I look forward to future posts! Pasta is one of my favorite foods, in just a few weeks the price of lobster will drop and I’m making this! I LOVE pasta! This recipe sounds delish ~ thanks for sharing. I hope you have a blessed Mother's Day. I love the pasta tips!!! Thanks for sharing. WELL MY MOUTH IS WATERING!!! this recipe sounds delicious!!!!!!!!!!! In your honour and in the honour of wall the Writwrs and Poets, I published an ilustration. 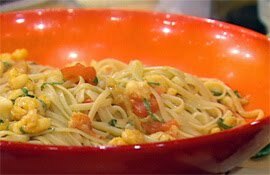 Lobster linguine…my mouth is watering!